Grocery shopping. It can make you or it can severely break your bank. I think the toughest part of being a grown up is figuring out what you need to buy for food for the week. Here are some of my helpful hints and tips for grocery shopping without breaking your bank. Think about your schedule for the week. Then think about what meals you are going to need to prepare. You’re going to need breakfast every day, a lunch for work M-F, and probably 5 dinners. Figure out what you want to eat for these meals. Pinterest is a great place to look for affordable but tasty meal ideas. Your breakfast and lunch meals can probably be the same all week but think about what you want for dinner. When you get some ideas, write down what you are eating for the week. This may seem tedious but it will help you write a list at the store for EXACTLY what you need. Once you have written down what you are going to eat, figure out what ingredients you will need to execute these meals and write them down. Once you have an ingredients list, cross off anything you already have in your pantry or fridge. What you are left with, is EXACTLY what you need to survive the week. Bring this list with you when you shop and I guarantee you that you will cut out a good $20 of unnecessary goods. After a while this will become easier and you’ll have to write less and less down. But this is a good place to start. Organic is something important to me. I try to really make sure that the food I buy is from as clean of a source as possible. That being said, if I were to buy all organic everything, I’d be living under a bridge somewhere. So I try to pick and choose what I buy organically. Chicken – Commercially produced chicken can have some scary additives in it. Purdue chicken is a whole 2 shades darker than the “all natural” chicken. If you buy a brand like Bell & Evans, the chicken is not necessarily organic but it was raised and processed in a cleaner manner. You’ll actually notice that if you put Bell & Evans chicken next to Purdue chicken, the Bell & Evans looks much healthier. The other way I’ll save on chicken is at Whole Foods. Whole Foods will typically do a “bulk” discount at the butcher case. I try to capitalize on this when they put the boneless skinless chicken breast on sale. I can save about $1 a pound buying 3lbs or more of chicken this way. I also encourage you to buy the full chicken breast. This means that the chicken tender is still attached. It’s incredibly easy to trim the chicken tender off yourself and this will also save you about $1 a pound versus the already trimmed chicken cutlet. Plus you get to have chicken tenders to use to make your own oven baked buffalo chicken tenders. If you are anxious about touching your own raw chicken, check out some YouTube videos about prepping a whole chicken breast. It’s super easy. For Red Meat (aka hamburger meat or steak) I always buy as close to organic as I can get. Red Meat can be scarily processed. Whole Foods or a local farm are the only places I’ll buy red meat. Veggies and Fruit – Any veggies or fruit with a “thin skin” I buy organic. So lettuce, apples, pears, carrots, etc. Anything with a thick skin or spends the majority of it’s time growing underground (potatoes) I buy commercially grown. I also try to strategically buy the organic produce. Things like organic berries will go on sale once a month or so. I try to pay attention to how long the organic berries haven’t been on sale to gauge when they should be discounted. Also organic produce is far cheaper at Whole Foods than it is at a commercial grocery store. Organic produce is also incredibly cheaper at the farm that grew it too. If it’s summer time, I rely heavily on farmer’s markets for produce. Dry Goods – The only real dry goods I’ll buy organically grown are the following: quinoa, non GMO corn based products, and flours. Organic Chicken / Veggie Stocks – This is important. If you won’t eat commercially processed chicken, you shouldn’t eat commercially made chicken stock. Organic veggie and chicken stock have much better flavor and aren’t going to be made with all the junk. Sales. They sound so enticing. Buy One Get One. Two for One. All gimmicky sounding words that make it seem like you’re saving money. Nine times out of ten, you will not save so much money on these sales. Anything on an “endcap” display, those products placed on the ENDS of aisles, are generally not a “steal.” They are placed there for a reason. Grocery Stores know that you’ll see those products, be drawn in by the sale flyer, and throw them in you cart in a matter of seconds. These are the products the store wants moved quickly or needs to get rid out. There are typically better sales happening within the aisle. Usually once or twice a quarter Grocery Stores will have stock up sales. They will put certain items on deep discounts so you can “stock up,” for the next few months. These can feature some great savings on things like baking products, stocks, soups, and meat. If you have a freezer at home, use it! You can freeze chicken / meat and thaw it out when you need it. If you individually wrap pieces of chicken in plastic wrap then place them in individual sandwich bags to freeze, you can pull one out to thaw in the morning and it’ll be ready by dinner. Just beware of sales. Think about what you usually pay for these items and see if it’s really that much of a savings. Store Brands are often seen as lesser quality than name brands. I will agree that certain stores have very low quality store brands. But some places you can save a lot of money buying store brand items. Stop and Shop’s Nature’s Promise line features all natural or organic items at a fraction of the cost for names brands. Hannaford’s also has a good store brand. 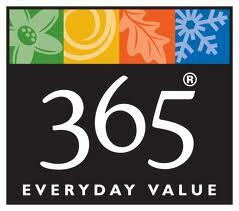 Whole Foods has a line called 365 that is an absolute STEAL. These products are so much less than traditional organic items and are usually better quality than name brands. Some of you may be surprised to hear that I do not coupon. I do not have the time to dedicate to couponing. I also think that coupons, for a single person only buying food for herself, entice me to buy items that I do not need. I don’t need 2 of everything and I don’t need to buy a ton of food at once. I have my pantry stocked with the staples (blog post to follow on those soon) and generally just purchase “fresh” ingredients each week like fruits, veggies, dairy, and proteins. OMG. I cannot emphasize this enough. Have a snack before you hit the store. If you go to a store hungry, you are DOOMED. You’ll buy anything and everything and you’ll be rushing around trying to get out of there so you can eat. Pop a granola bar or a handful of almonds to prevent starvation shopping. As you’ve read, I make a lot of my own food from scratch. I also substitute things frequently in recipes. 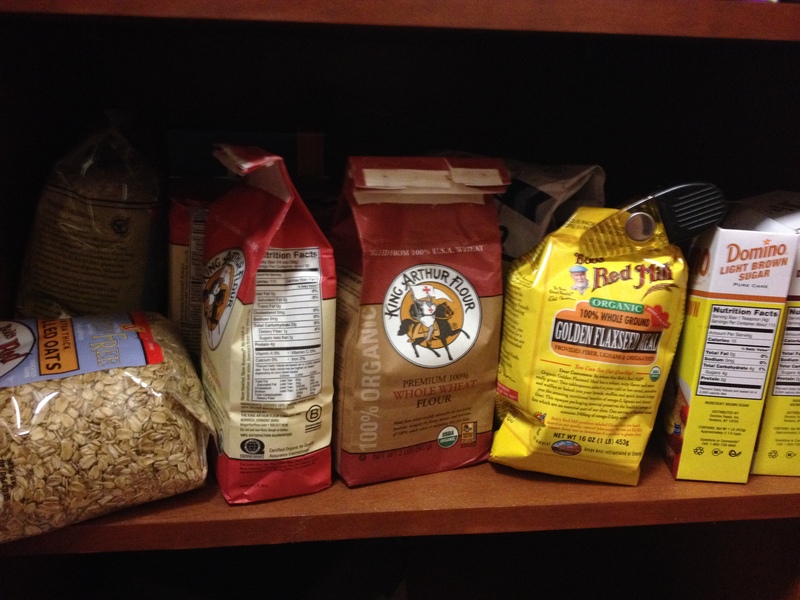 So here are my pantry staples for baking. Note these are only staples for my healthy baked goods. The fat kid treats have their own staples which I’ll touch upon in a later post. This is the most organized this shelf has looked in a long time. Don’t be fooled. 6 months ago I was told to eliminate gluten from my diet. During this time period, I got REALLY creative with baked goods. The gluten free flours are treacherous. I did a lot of process of elimination to find a good one. If you are in the market for a decent all purpose gluten free flour, I highly recommend King Arthur’s Gluten Free All Purpose Flour. This is in almost every grocery store now and has the least weird flavor. Be sure to do your research on adapting regular gluten filled recipes for gluten free. Anyways, it was during this time that I found gluten free oats. Not all oats are safe for a gluten free diet so you have to buy the ones labeled gluten free. 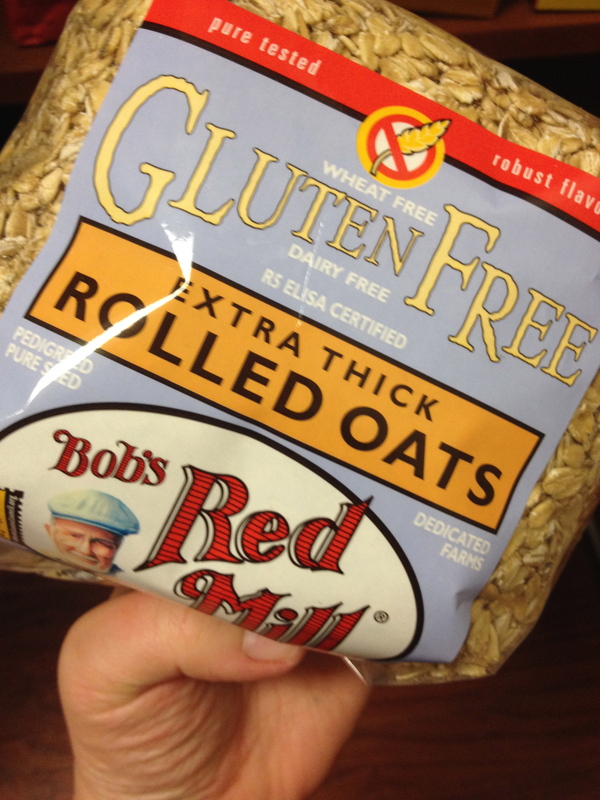 These oats from Bob’s Red Mill are thicker than normal and have a decent texture. They don’t go to complete mush. I use these a lot in muffins, granola bars, and other quick breads. I pick and choose what I buy organically. Flour is something I’ve recently started to buy organic. It honestly makes my baked goods better, especially using organic whole wheat flour. Any “quick bread” recipe that calls for white flour, I will either use all whole wheat or do 1/2 white, 1/2 whole wheat. Whole wheat flour adds some fiber and whole grains to the dish. 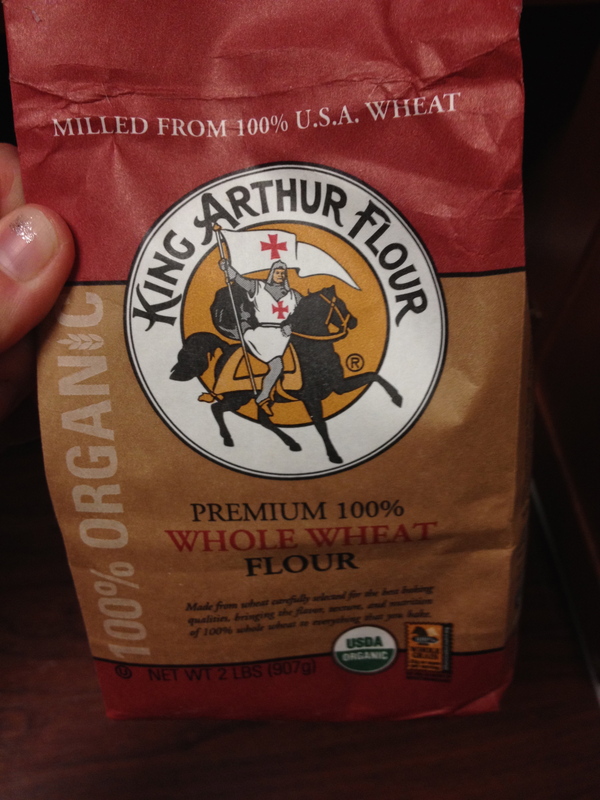 My mom used King Arthur Flour growing up which means I use the same. I can’t use any other brand. I’m convinced stuff won’t taste the same. I need a manicure and a better camera. Ignore both discrepancies please. Isn’t this exciting guys?!? FLAX! Ground flax meal is an easy to addition to almost any baked good. It adds some fiber and omegas. 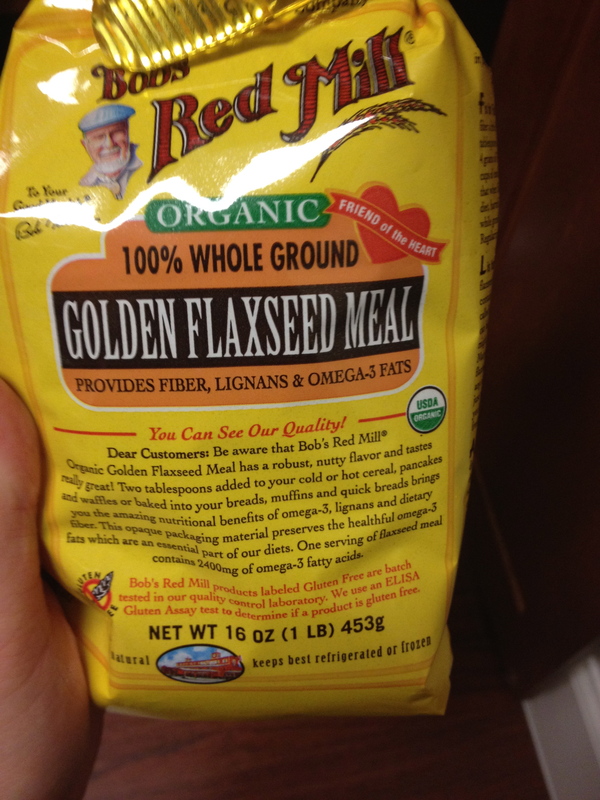 If you have never cooked with flax before do some Googling on it. It’s nothing something you want to add too much of. You all know my love affair with coconut. Coconut oil, milk, or raw coconut I love it all. 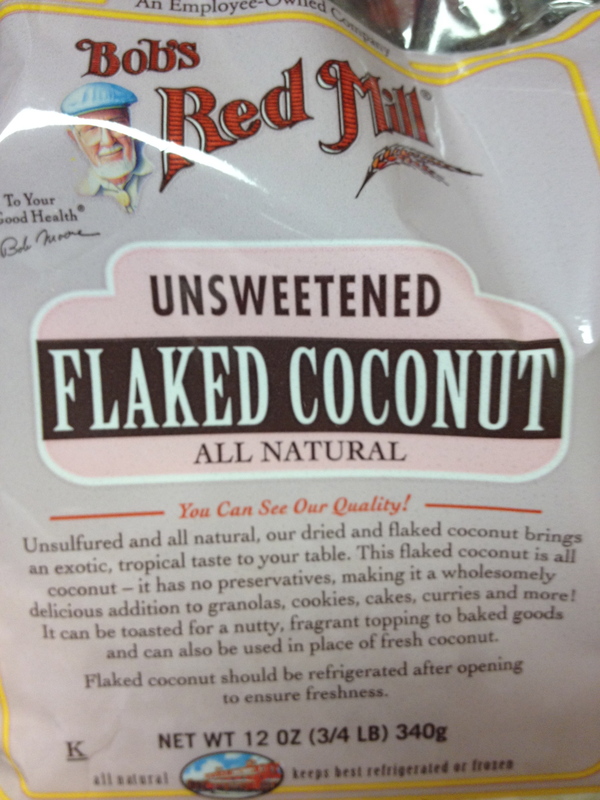 You can add unsweetened flaked coconut to a lot of baked goods. I’ll add some to muffins or even to cookies. It adds a nice texture and coconut is rich in the MCT fat I talked about yesterday. Sometimes I’ll even add it to smoothies or on top of yogurt. I cannot speak highly enough of applesauce. 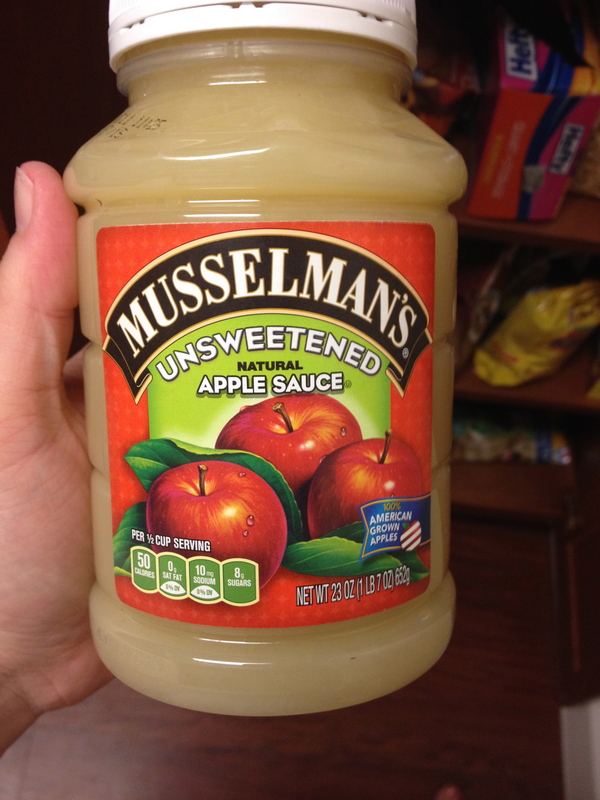 You can replace any oil / butter in a quick bread / brownie / muffin recipe with applesauce. You won’t notice a thing different. It saves you so much fat in a recipe. You can also use less sugar by replacing the oil / butter with applesauce. I would not recommend swapping applesauce for butter in things like cookies or cakes though. More coconut! Surprised? I hope not. I will bake a lot with coconut milk because it helps any type of dish last longer. 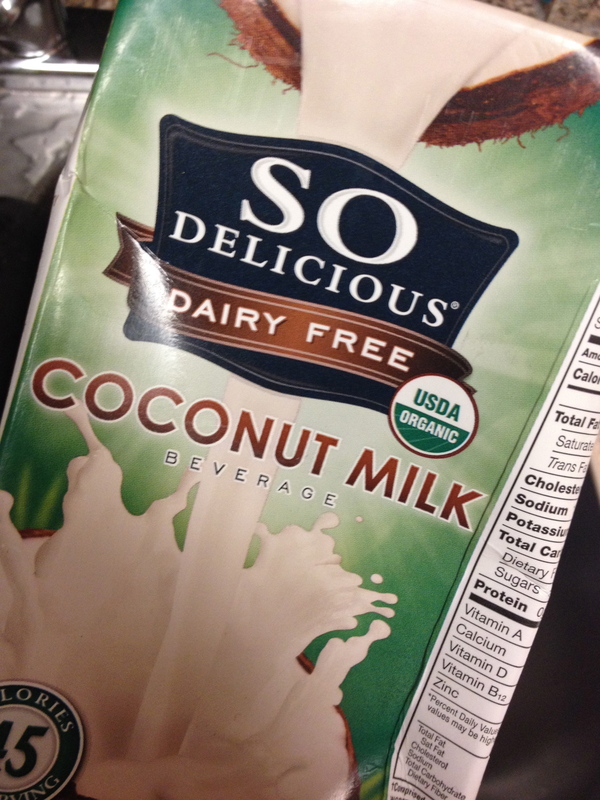 Plus, I love coconut anything. And no, this will not make your baked good taste like coconuts. It’s pretty much flavorless. 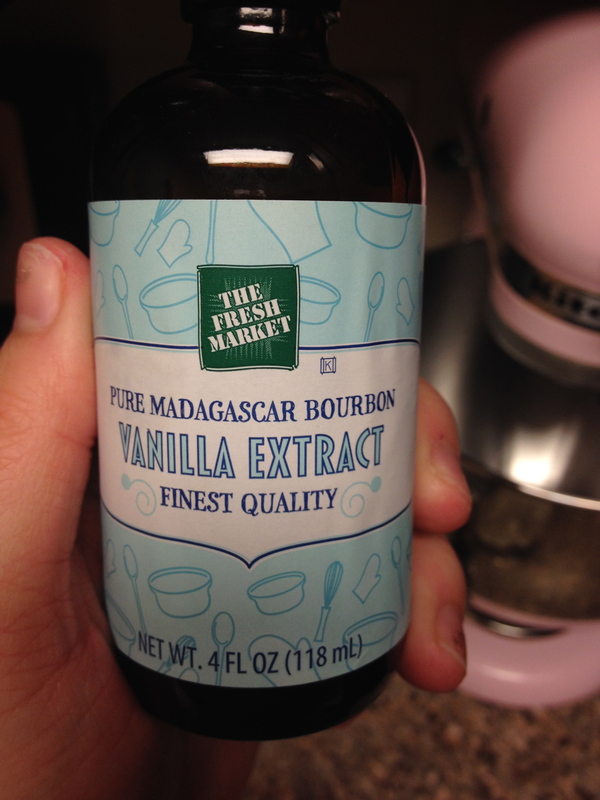 A quality vanilla extract will change any dish. The higher the quality, the better the flavor. It’s one item I splurge on. This is from my last trek to The Fresh Market. I do not shop there anymore because frankly it’s just not healthy. They put up a good front but it’s not filled with healthy stuff. Listen, I know I’m a big advocate for minimally processed food. However, if I were to buy the all natural PB every time I made a PB based baked good, I’d go broke. My fellow office mates are big fans of PB. So when I bake stuff for work I try to incorporate PB into whatever I bake. Those Peanut Butter Blondies I made used almost a whole jar of PB. It’s wild. 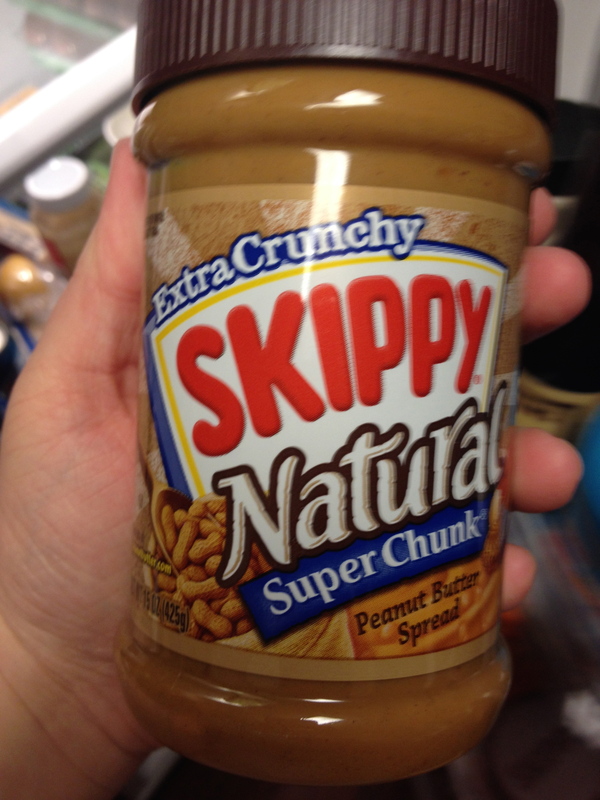 Anyways, I try to look past the processed-ness and get Skippy’s Natural Peanut Butter. It’s less expensive and bakes really well. I try to keep a jar of smooth and a jar of chunky on hand at all times. This is not what I use for baking. But this is what I snack on while I bake, especially with fat kid treats. 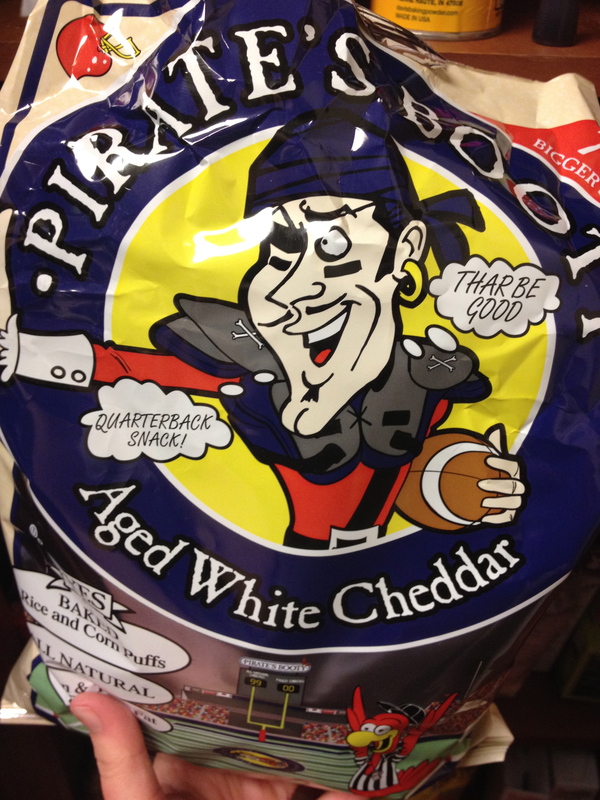 To avoid eating all the ingredients and / or dough, I’ll portion out a serving of Pirates Booty to snack on. I LOVE this stuff. Seriously think I could live off of it.